A calculus for classical propositional sequents is introduced that consists of a restricted version of the cut rule and local variants of the logical rules. Employed in the style of proof search, this calculus explodes a given sequent into its elementary structural sequents—the topmost sequents in a derivation thus constructed—which do not contain any logical constants. Some of the properties exhibited by the collection of elementary structural sequents in relation to the sequent they are derived from, uniqueness and unique representation of formula occurrences, will be discussed in detail. Based on these properties it is suggested that a collection of elementary structural sequents constitutes the purely structural representation of the sequent from which it is obtained. Supported by the DFG Project “Paul Hertz and his foundations of structural proof theory” (DFG AR 1010/2-1). 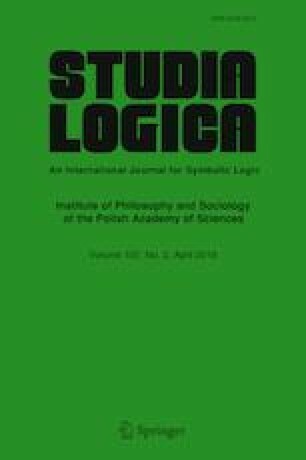 Arndt, M., Eight inference rules for implication, Studia Logica, pp. 28, 2018 https://doi.org/10.1007/s11225-018-9821-9.